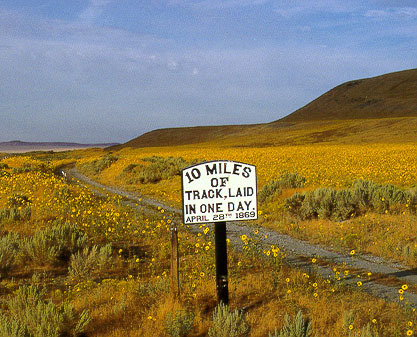 Do you remember the transcontinental railroad, that fascinating story from your high school history class? This subject was one of the highlights of late 19th century American life, for good reason. Let's look at it again and see what hidden lessons for our future it may hold. 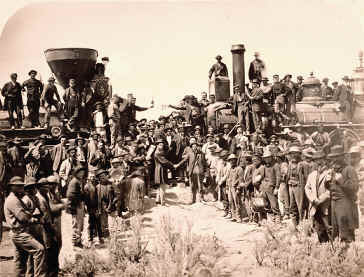 After a seven-year sprint and major, often heroic human effort, the first phase of construction of the transcontinental railroad had its watershed moment on May 10, 1869, when the Central Pacific and the Union Pacific railways joined at Promontory Point, Utah. Coast-to-coast travel time was reduced, in that instant, from four to six months to six days. Soon after, our nation underwent a phase change, thenceforth becoming a unified whole in its political, economic, and now even its cultural affairs. In other words, as the linkage density for this new mode of trasport between culturally unique destinations increased in subsequent years, our swarm computing shifted permanently to a whole new level of acceleration. (For more on this compelling story, we suggest Stephen Ambrose's excellent Nothing Like it in the World, 2001). This was an exciting time. With the Civil War and its deeply divisive issues receded behind us, we caught the noble fervor of nation building. The closer this wondrous new network came to completion, the greater public expectations rose. Competition between construction crews intensified as the first transcontinental link drew closer. Records were destined to be set in this heated and hugely optimistic climate. 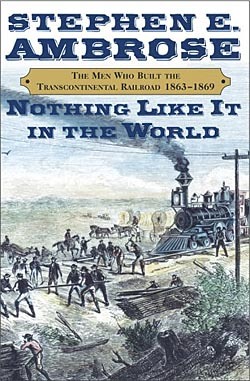 On April 28, 1868, on the Union Pacific side, on a $10,000 bet, Charles Crocker's famously well-trained Chinese and Irish gangs laid ten miles of track in a single day, a feat never duplicated by human beings in railroad construction since. (See Mary Fraser's beautifully illustrated Ten Mile Day, 1996). Bravo! Creating the first link in the new network was only the beginning of the story. The real growth and work of the railroads followed in the decades after. By the end of the 19th century, a small handful of surviving railroad companies in the U.S., U.K., and Japan had become the most valued stocks in existence. The same boom and consolidation process happened all over again in the first half of the 20th century with the manufacture of automobiles. By the mid 1930's General Motors had become the most valued company in the world. The boom (and early consolidation) is being recapitulated again today in the telecommunications and computing sectors. In each case, the construction of these networks creates a new level of matter, energy, space, and time compression (MEST compression) in our social computational capacity. Furthermore, once the unique linkage density (one simple measure of complexity) between cities as social actors reaches a sufficient size in this new and faster domain, an irreversible phase transition, a "social singularity" of sorts, can be said to have transpired. In other words, we have then developed our culture into a more complex information-processing environment, with emergent capacities that were unsustainable and perhaps even unimaginable within the old, pre-transition culture. Who anticipated, for example, the broad and permanent relaxation of morals and the increase in individual independence that would be irreversibly introduced into our culture by the advent of the automobile? We must also never forget that this revolutionary new technology, the railroad, was built at the hands of an amazingly industrious immigrant labor force. On the Central Pacific, Chinese workers comprised as much as 80% of the railroad's laborers in this period. In addition, Irish, German, and other European immigrants, freed slaves, and former Union and Confederate soldiers played key roles in the construction. These humble and noble individuals worked at an inhumanly high level of productivity to create a powerful, valuable technological platform for all of humanity to enjoy. We have had no equivalent Promontory Point experience with the internet, as yet. I'm sure the uniting of the world's continents via the ARPAnet (in the 1980s?) and via the modern graphical internet (1990s) was celebrated by a number of technical elite, but it didn't make the radar screen of the average first-world citizen. This essay will seek to convince the reader that our Promontory Point lies yet ahead, inching closer every day and soon to become obvious to many of us in the first world at large. The frontier closing excitement will begin again, and then competition will intensify until a functional first-generation Conversational Interface (CI) emerges that is powerful enough for all of us to use. Before discussing that, we can note a number of other interesting parallels between the construction of the railroad network, the automobile network, and the creation of today's first-generation internet. First, as Santa Fe Institute economist Brian Arthur has argued, the dot com speculation bubble of the 1990s was in many ways identical to the railroad speculation bubble of the 1850s. If there's one thing that puts us in a frenzy of irrational exuberance, it is having a glimpse of an inevitable phase transition looming just ahead, regardless of whether we can actually reach it now (unlikely, in most instances) or in coming decades (the way events usually unfold). Second, it is clear that the real rapid growth of each of these new techno-economic sectors always begins after the initial speculative crash, once the enabling technologies finally become both cheap enough and mature enough to begin the good work of rapidly building the vast majority of the network. This process is just starting now, for the still-stupid, still-slow, still-low-bandwidth and bug-ridden internet of our early 21st century. Third, we know there will be a massive consolidation of companies as first-generation internet technology becomes yet another commodified and circumscribed industrial sector. This contraction from a large number of initial, evolutionarily varied, and mostly untenable companies to a few strong and developmentally strategic survivors is a process of necessary, creative destruction. As Joseph Schumpeter reminds us, it all looks quite natural from a historical, bird's eye view. Fourth, socioeconomic groups are deeply affected by these transitions. In the railroad example, the American Indian culture was very negatively affected. Our reservations were an ineffective attempt to remedy the damage caused by the closure of the frontier, yet they were the best response we could conceive at the time. Many Chinese immigrants, after the railroads were mostly built, were also negatively affected. Those who integrated into service work in the newly prosperous cities generally fared better than those who went into the mines, work which led increasingly to job displacement by new mechanical technologies. We can and must do better in providing opportunities to technologically disrupted socioeconomic groups in the future, as we work toward more responsible, sustainable and culturally appropriate development. Fifth, we note with increasing interest that it is the hard-working 'immigrants,' again, who are the most powerful constructive forces behind the emergence of the new infrastructure. Today's early global internet is being built by the mindpower of teeming masses of young programmers in India, Asia, third-world Europe (Poland and other satellites of the former Soviet Union), Latin America, and other such developing economic zones. Tech support-trainable third world youth, waiting to be utilized, may already outnumber the first-world technical support population by two or three to one. [These numbers are rough estimates at present. I'm trying to firm them up.]. Over the next thirty years, I would expect the first world/third world ratio of competent, trained tech staff to numbers to rise closer to ten to twenty to one. This last point stems from the simple mathematics of globalization. Looking at it from the first world, we realize we can't change the numerical and cognitive advantage of the third world's exponentiating technical force, even if we wanted to. There just aren't enough U.S. children to staff the rapidly growing technical ranks we are going to create over the next few decades. Even if we could double the present effectiveness of our science and technology education, itself a valuable social goal, we would have little effect on the globalization of technical jobs. A network property is emerging here. This argues strongly that the best strategic educational goal for the U.S. and the rest of the first world is to help our children learn to be come effective collaborators, partners, and managers of this burgeoning global technical workforce. The U.S. technical and managerial work force will work smartest by helping all the most eager and globally productive humans to come together rapidly, fluidly and flexibly to develop all manner of technological and social solutions to human problems. In the process, we should expect to increasingly minimize and bypass politics in this new bottom-up driven world we are creating. Managers need a basic science and technological fluency, but most importantly, they must know where to find the world's natural, technical, and human resources, and how to work with them in ethical, non-zero sum creative interactions that are strongly desired by all the participants. As the internet matures, keep your eye out for social software solutions (collaboration-oriented outgrowths of today's multi-player video games) that will allow our rapidly communicating, highly interactive Millenial generation engage in this kind of global entrepreneurship with increasing ease. We all know that our manufacturing base, the old network, became multinational in the late 20th century's Manufacturing Globalization Revolution. Large companies either voluntarily downsized and outsourced much of their first world manufacturing, or they fell victim to the unstoppable shift. Never again can the U.S. be a major labor center for the world's manufacturinga numerical disadvantage, technological diffusion, and an increasingly developed and borderless world ensures this must be so. A careful initial analysis suggests that we are in the beginning stages of what might be called an Information Technology (IT) Globalization Revolution, a new phase of accelerating development where our emerging planetary internet and many of its IT services will very soon be built primarily by third-world intelligence, for the greatest absolute economic benefit of the first world, and yet for the greatest relative benefit of the third world, in a major step toward closure of our still widening rich-poor divide. Over the last fifty years, the economic difference between the top fifth and bottom fifth of the world's populace has increased from a multiplier of approximately 35 to 1 to 80 to 1. Systems dynamics tell us this trend must eventually saturate and reverse, as the planet is a sphere of limited size becoming an increasingly uniformly and densely linked network. That is poetic justice on a broad scale. It may be true that the major third-world advantages of this massive new construction project won't be realized until after the conversational interface arrives, when any curious human mind, regardless of background or resources, will be increasingly able to make use of the system as an educational, communication, and collective produtivity tool. But that is only a short-term detail. It doesn't change the long-term nature of what we are doing, creating a more informationally equitable world system that is now so close to emerging that we can finally see it, waiting patiently ahead, like Promontory Point. At present, almost everyone writing about third-world development doesn't yet fully appreciate what's coming on the technological side, the incredibly unifying anthill that is now being rapidly built by all the lean and hungry technological newcomers in Bangalore and Beijing, in Puna and Prague. Furthermore, when technology pundits do notice the recent phenomenon of third-world technological advance, they often commit the sin of overestimating the future social and economic effect of the newcomers. Again, they don't see that the emerging network is the organizing force, and is the best vantage point from which to consider the developmental trajectory of the system. The proposition that today's third-world technical workforce will soon dominate the first world is as much of a myth as the proposal, once seriously entertained, that underfunded and ill-experienced dot com entrepreneurs would displace brick-and-mortar industry. The sobering reality is that these talented third world newcomers won't even be able to stay independent of first-world employers in coming years, much less take over the planetary software industry. As always, the network is king. Some of the fastest growing employers in India, for example, are now U.S. companies like Microsoft. How long did it take for that to happen? As soon as the network infrastructure matures a bit further, all of the best emerging talent in the global economy will come into economic association with the present holders of capital. Not only multinationals, but all the mid-size and mom-and-pop first-world entrepreneurs that go global are already gaining the tremendous leverage of the international workforce. That is heartening for a future of perennial competition in emerging technologies. So we see that the railroad analogy truly holds. Even with all their technical expertise, the new global technological work force really is the blue collar productive class in the present planetary economic hierarchy. Like the 19th century Chinese railroad laborers, third-world information technology workers will be the underappreciated heroes on the front lines, rapidly constructing today's transcontinental railroadan intelligent planetary software and hardware network for all to use. Hearkening back to history, we note that as the Promontory Point completion drew near, San Francisco contractor David Hewes had a solid gold spike created to commemorate the event. Its head was engraved with the words "The Last Spike", and its sides with the names of some of the prominent movers of the day. 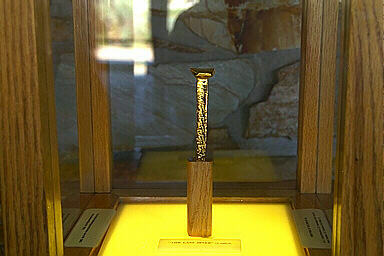 The golden spike was ceremoniously driven home at the completion of the network. The gold signified the unprecedented social and economic wealth that would be catalyzed by this revolutionary new technological platform in subsequent decades, a fitting end to a grand effort. So, what is the golden spike for today's burgeoning internet? What level of usability will we require before the net becomes a unifying technology on the human frontier? Where exactly will we find our next great Promontory Point? We suggest it will emerge when technology developers create a conversational interface (CI) that is, at least technically, minimally useable by everyone in world, regardless of their education, language, or culture. It will need to be one that is free, or at least affordable to working adults in all nations. It will need to be fast, ubiquitous, reasonably reliable, and at least smart enough for children (and many adults) to access on a frequent basis, whenever their curiosity causes them to seek more information about the world in which they live. We leave more precise definitions for others. It is clear from present developments (todays CIs for directory assistance, flight information, stock quotations, etc.) that there will be many small, domain-specific CIs en route to grander ones. Yet there will come an inevitable time when we will all feel connected, symbiotic with our technological extensions, and thenceforth forever naked outside the matrix. We know it must be a largely stupid interface at first, speaking back to us in a 'pidgin' language with intelligence only in very circumscribed domains, such as cellphone, basic skills education, tool use, internet surfing, communications and productivity software, and other commonly accessed tasks. Nevertheless, with the entire planet coming to depend upon it on a daily basis, it is also clear that this interface will quickly become a more fluid and knowledgeable information source, for an ever-growing variety of subjects, than most humans we know. How much would you presently pay for a cellphone-PDA that you did not need to touch to use, one that has no keypad? What would you give for a GPS-linked cellphone that could tell you the closest and cheapest place to find a product or service, one that would allow you to shop a store by video telepresence, and if it was one of those rare things you couldn't do by telepresence, provide realtime driving directions, given present traffic conditions? How about a phone that could relate all the interesting events occurring in your area that night, including what your friends have publicly posted to the "voice board" about their evening activities? Would you like one that could remind you of your calendar, inform, entertain, and enlighten you on any practical subject you don't presently understand? Would you like a wearable phone-garment you can speak to by name, one that can provide news, entertainment, or ready answers to such questions as "the definition of transmute" (to change or alter in form, appearance, or nature, especially to a higher form), or "the name of that popular book on liberty recently written by that Newsweek guy" (The Future of Freedom, Fareed Zakaria, 2003), or verbal help in fixing any of your technologies when they invariably break? Would you like one that could archive and play back portions of anything you've said, seen, or heard in recent years, for your own edification? Each of these functionalities are add-ons to the basic CI structure, but we see where the system is headedtoward a profoundly empowering and awareness-raising human environment..
Today's computer telephony applications (e.g. Bell Canada's Emily, or Delta's flight information system), being installed widely by such progressive companies as Nuance and SpeechWorks are a clear foreshadowing of what we can expect in coming decades. These systems should be aggressively supported and promoted, as they are part of the developmental lineage of the CI to come. Their advancement should be a high priority for funding at the governmental level, over many other less strategic priorities, and we should strive to subsidize their emergence in the business world, wherever they make economic sense. A few historical acknowlegements are in order. Both longstanding governmental funding (e.g., DARPA) and a few exceedingly large companies (IBM, AT&T) have been working hard on the problems behind the CI (voice recognition, text-to-speech, natural language processing, language translation, artificial intelligence) for at least fifty years. A long string of early, ambitious projects have had only very minor success in these domains. So what's special about this decade? Quite a lot, in fact.. The early 21st century is seeing a grand convergence of economic and technological opportunity for CI advances. We finally have an impressive base of CI-ready appliances (ubiquitous cellphones, a rarity until the last few years), platforms (voice-over-IP), impressive processor speeds, plentiful memory, increasingly cheap connectivity, reasonable bandwidth, critical new speech standards (e.g., voiceXML, SALT, etc.) and myriad application environments (every major website can be voice enhanced). There are now significant economic incentives for our "zeroth generation" CIs to emerge, and as the recent growth of computer telephony (e.g., Tellme) has shown, CI-related software is now powerful enough to deliver value in the business world. Consider this: in 1993, artificial intelligence (neural networks, expert systems, belief networks, decision support, and agents) received less than a billion dollars a year of funding, almost none commercial. These subjects, only a decade ago, were primarily governmentally funded curiosities. By 2003, these fields of AI had collectively grown to 13 billion dollars, the vast majority of this commercially funded. Artificial intelligence applications, as incremental enhancement of web-based systems, has finally arrived, and we can now reasonably expect the CI is soon to follow. None of this guarantees that we will be particularly intelligent in our early development of these new technologies. Again, history may help us from repeating our mistakes, if we let it. Do you recall, in the 1980's, when many major publishing houses blew millions of dollars in "multimedia" development? That was the buzzword of the era, and yet CD-based graphical narratives, served up on slow, low-resolution machines turned out to be a noncompelling technology. The internet replaced multimedia, less than a decade later. We got carried away and overinvested. In the 1990's we did the same thing with dot com, with "fiber" and "wireless" in our telecom upgrades, and have done so many times in the past with other immature, early-stage platforms. We are now threatening to do the same with "nanotechnology" (cross your fingers, the jury is still out in this regard). All this overinvestment doesn't make the technologies intrinsically wrong. What's often mistaken is the strategy we choose: the level of commercial investment relative to maturity, the ratios of applied to basic research and development, and the choice of initial products and services to bring to market. In the rush to achieve market dominance, companies often don't balance their investment with what will actually be used. At any particular point, there are only a very small number of applications that are the most cost-effective for any developing technology. Such is the case with all IT hardware and software. We need to be smart about our incremental investment. Especially now that the CI, like AI, has moved from a government-supported dream to a nascent commercial reality. In short, we've still got long way to go. But here in 2003, with growing commercial success, we can see the incremental steps we'll be taking to construct the CI dream. In a more mature form, the CI uniquely represents an intelligence interface that is so sophisticated, so inexpensive, and so natural that no education or economic resources are needed to use it. It is a true equalizer, allowing all of the world's populace to learn as fast as their curiosity will drive them, and to use spoken language to direct an ever-growing range of increasingly intelligent, self-provisioning, and self-repairing machinery in their daily lives. It is a sobering fact that the first world could never afford to provide, in human form, the basic educational and productivity resources to the third-world populace that tomorrow's crudely intelligent linguistic interfaces will soon provide. There are just too few of us, and too many who have been denied our standard of living. The fact that only 10% of our planet presently lives with any real wealth is a dictate of the old hierarchical model, one that has served its purpose for a prior developmental phase of history but one that is soon to be outmoded by our new network model, in the same way that democracy ultimately outcompetes autocracy once information flow among human citizens becomes rich and varied enough for them to think for themselves. As Teilhard de Chardin notes (The Human Phenomenon, 1955/99), modern communications are in the process of "cephalizing," or creating a head for, the entire planet. We will all soon be linked as one unitary high-density system, in political and economic structures that are much flatter, less divided, and more amorphous than the pyramidal structures of the past. It now seems inevitable that the "first phone call" that most of the Bottom Three Billion (B3B) human beings will make will be not only to each other but also to a partially intelligent machine, to receive useful information or to command some simple function. Perhaps the most interesting question is when the ability to make this phone call will become an implicit or explicit right of every human being on the planet. In 2015? 2030? 2050? In many ways, the steepness of the third world technological development curve is ours to choose. In a democratic society, once the price of learning becomes cheap enough, the opportunity to learn at a new more complex level becomes a natural right of the citizenry. We see this in U.S. society where the right to life, liberty, and the pursuit of happiness affords us free public education. Without adequate education, there is no liberty. The CI will soon usher in a level of global sophistication, informed individual liberty, and liberal democracy that we can today scarcely imagine. Could Victorian society have imagined the 1960's? In the same way that trains are mass transit solutions in such places as India, Mexico, and Africa today, the CI will fittingly be the mass education solution of the generation that grows up from 2020-2040, if we are successful in bringing it to life over the next two decades. Again, the real question, the one we have the most control over, is just how rapidly we are committed to making this happen. Can we appropriately prioritize this coming developmental phase transition in our information technology, one which is currently in competition with so many other less important, more evolutionary, and yet still quite pressing issues of the day? Can we get the world's populace excited about the daily progress we are making on the general-purpose CI in those present specialized domains where it already improves their daily life? Can we chart our annual progress toward a first-generation internet-interfaced CI becoming at least technically, if not politically, available to every child on the planet who desires it? I think we can. Promontory Point can be defined and worked toward with increasing hope, energy, and excitement every year. Let's do our best to make communications and computing progress top priorities in our political, economic, and social choices in these few and final remaining "frontier years" before the Symbiotic Era. The Wild West can't continue forever, though it sometimes seems it can, when we look at our presently primitive technological systems. Once we have railroads, civilization inevitably moves in. So it must be with tomorrow's Conversational Interface to the planetary internet. Accelerating compassion, education, security, social justice, creativity, and individual and cultural diversity must follow. We at the Acceleration Studies Foundation want to do all we can to catalyze Earth's exodus from the Wild West, while protecting those who might be hurt by ongoing development. We'd like to do our small part to make tomorrow's interconnected and naturally interfaced world arrive as soon as possible, as long as we are following a responsible path in the process. Would you like to join in our efforts to explore and publicize the benefits of Promontory Point? Send us an email at mail(at)accelerating.org. Let's make it happen!